First Look: 'Solo: A Star Wars Story' Imperial Conveyex Transport – AiPT! 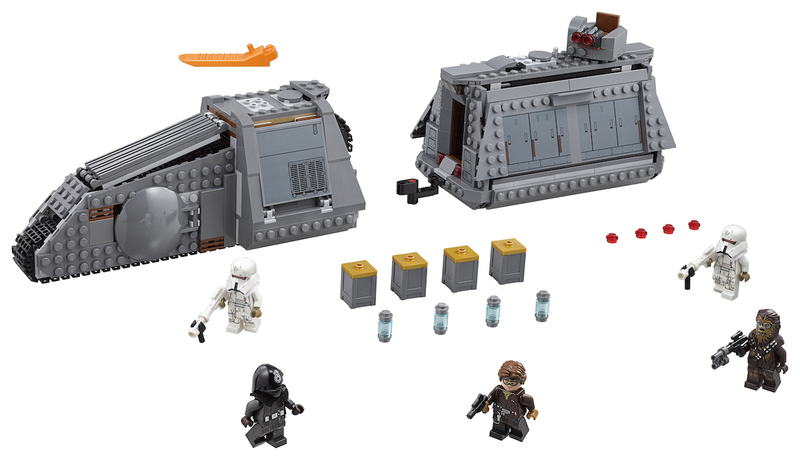 Check out this new set from LEGO complete with Han Solo and Chewbacca minifigures. Solo: A Star Wars Story was one of the biggest surprises for me this year as it was highly entertaining and opened up the world of Star Wars that much more. LEGO revealed a new set today to appease fans like me with the Imperial COnveyex Transport set. This set comes with 622 pieces, runs $89.99 and contains 5 minifigures. The best part? A Chewbacca figure that looks totally badass. Jump aboard the speeding LEGO® Star Wars 75217 Imperial Conveyex Transport with Han and Chewie for a daring raid! Dodge the gun on top and clamber onto the cargo wagon. Pop the sides to reveal the precious coaxium, but watch out for the Range Troopers with their magnetic boots–they could appear from anywhere! This LEGO Star Wars tracked locomotive is stopping for no one! •	Includes 5 LEGO® minifigures: Han Solo, Chewbacca, an Imperial Gunner and 2 Range Troopers. •	Imperial Conveyex Transport features an engine section with opening front revealing a wraparound tank track, opening driver’s compartment and a weapon store. •	Detachable, wheeled cargo wagon features opening sides and top hatch, a movable rotating gun turret with 2 stud shooters, a hitch at the back and studs on the side for the Range Troopers to walk on. Inside, there’s an access ladder leading to the top hatch and space for the 4 included coaxium containers. •	Tilt the train from side to side, just like in the movie. •	Make believe the Range Troopers have real magnetic boots and climb them up the sides of the train! •	Weapons include Han’s blaster pistol, Chewbacca’s sawed-off blaster rifle and the Range Troopers’ blaster rifles. •	Also includes 4 coaxium box elements in containers. •	Combines with the 75215 Cloud-Rider Swoop Bikes and 75219 Imperial AT-Hauler for the ultimate high-speed train heist. •	Hitch up multiple sets for an even longer train! •	Imperial Conveyex Transport with cargo wagon measures over 4″ (12cm) high, 16″ (43cm) long and 3″ (9cm) wide.